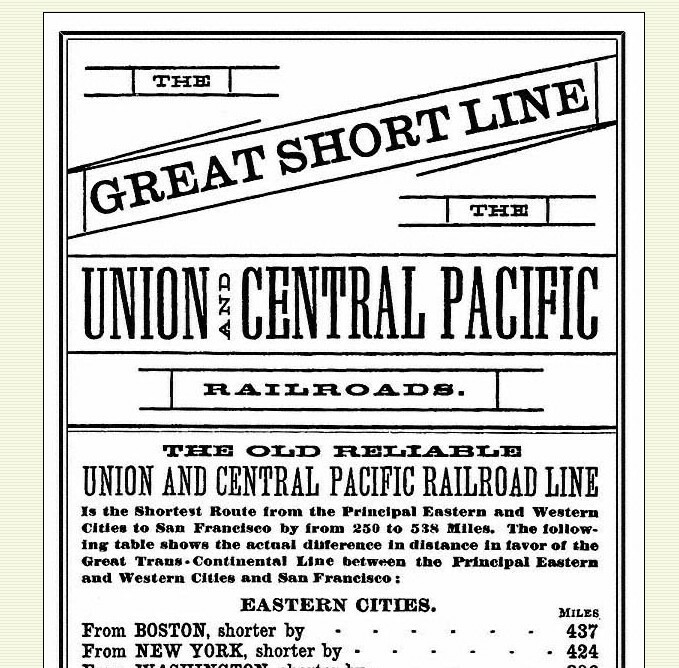 Access to the vast reservoir of information available via the Inter-net is one of the circumstances of my life that has made fulfillment of my interest in railroad history possible. 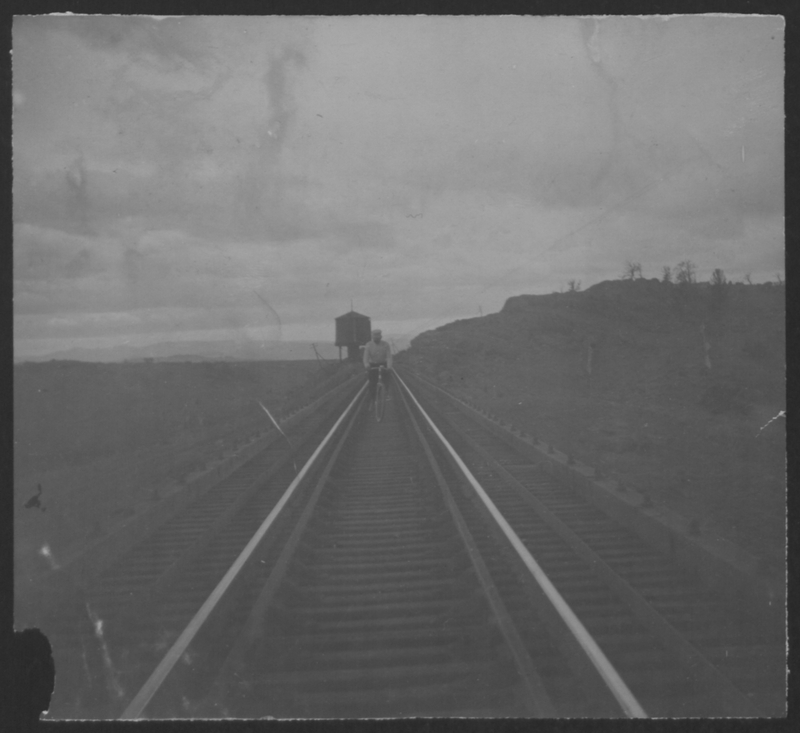 Using the Inter-net, I am able to find and study digital reproductions of the original photographs, manuscripts, and historic documents that constitute the body of railroad history. Even though the materials that come to me are reproductions, I feel privileged, and sometimes thrilled, as I study and learn from the fruits of my searches. I also feel a sense of personal responsibility that requires me to treat these reproductions as if they were the originals. I do not feel free to avail myself of processes that make it possible to alter the reproductions in such a way as to confuse or change the historical content, nor do I attempt to “improve” the artistry of the reproductions. In spite of the intended certitude of what I have written above, I am conflicted. Perhaps the best way to explain is to to provide an example of the source of my conflict. 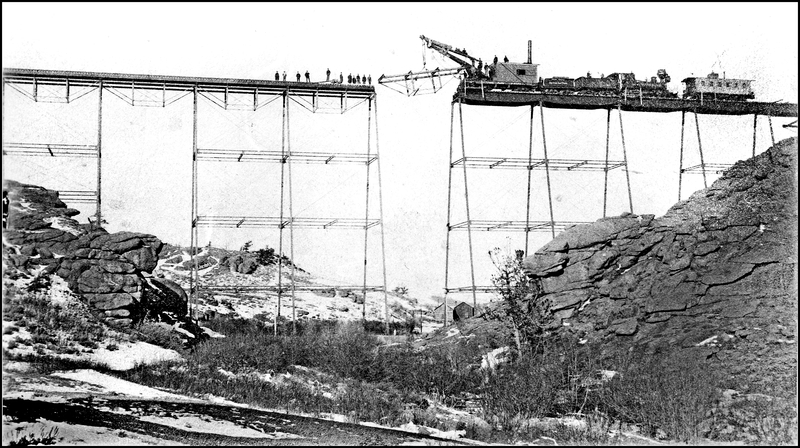 THE REMOVAL OF A 40 ft. WROUGHT IRON SPAN DURING THE 1885 REBUILDING WITH STEEL GIRDER SPANS. The image is from the American Heritage Center photographic collection. The image documents how the truss spans were removed. It is obvious the image condition is so poor that a detailed examination is problematic. It is possible the image can be edited to permit an examination of adequate quality. The image, in the rendering above, has been edited and the image is ready for a detailed examination. So far so good, but which one of the two above images should I select if it became desirable to submit the results of the detailed examination and an image for publication? This is my conflict. I am bound by my pledge to not “alter” the reproduction image of the original photograph. At the same time, I wish to publish an accurate representation of the source of the published conclusion. These two choices are mutually exclusive in that both cannot be chosen without providing an extensive exposition of what constitutes “editing”and both images for comparison. This seems impractical when dealing with many reproductions. So we will limit the discussion to the “either/or” choice. The reproduction image is of such poor condition that examination of image details is is rendered unproductive, but the rarity of the original makes examination and “publication” desirable. The number of reproduction cycles is sufficiently large to yield a poor reproduction image, but “publication” of the image is highly desirable because of the subject matter of the reproduction. The subject matter of the reproduction is of importance to an exposition being presented, but the inherent quality of the original is poor. An author’s note documenting the editing process is included in the published work. 1) Rotate to align image if necessary. 2) Crop to remove white space, ragged edges, and out of square shape. 4) Change color to “grayscale”. 5) Set color using “auto adjust”. This exposition represents my present thinking on the subject of editing reproduction images. I have an open mind on this matter and welcome comments. Note: These images are in the photographic collection at The American Heritage Center located in Laramie, Wyoming and are used with permission for my personal use only. PLease do not download images. I recently visited the ghost town of Piedmont on the way home from the 2014 UNION PACIFIC HISTORICAL SOCIETY convention, held in Ogden, Utah. A fellow member of the Society had told me Piedmont was worth a visit on the way home. He was right. 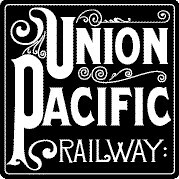 The road to Piedmont, from either east or west, lies on the original 1869 roadbed of the UNION PACIFIC RAILROAD. This side trip gives the traveller a sense of the isolation that was the lot of the builders of the railroad. Piedmont lies between Green River and Evanston in the state of Wyoming. The images above were obtained during the side trip. 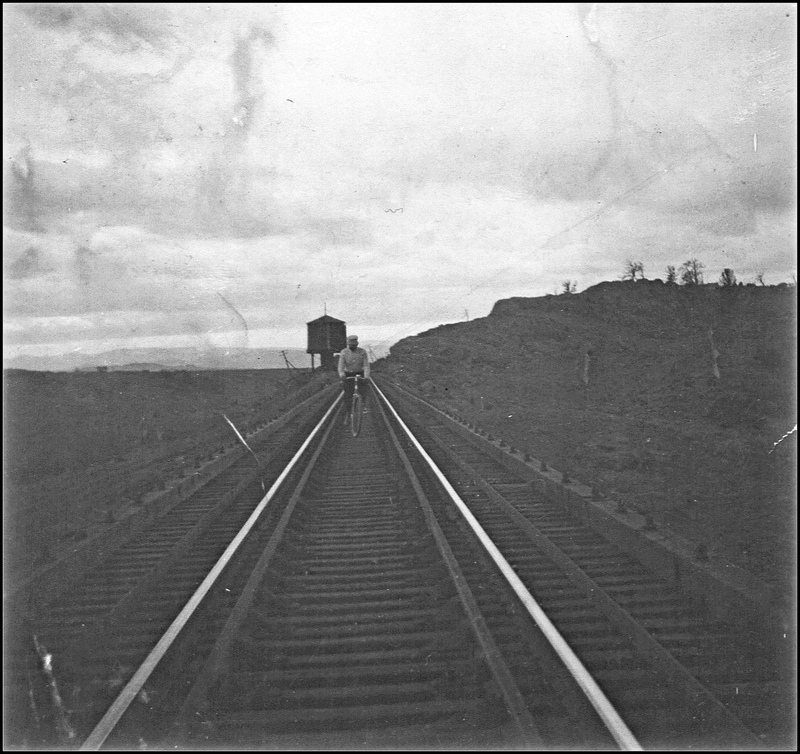 The original main line was re-located to its present route around 1900, as part of the Harriman Era improvements. The town of Piedmont slowly became the ghost town of today. A small marker reveals the school was closed in 1950. 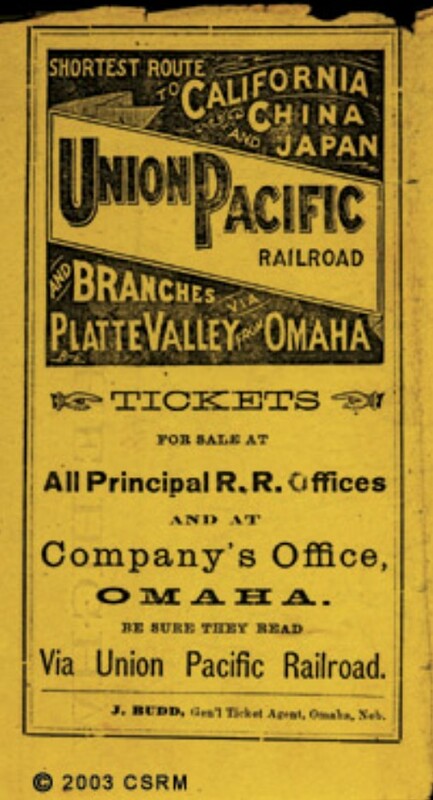 I recently learned Piedmont is the place where construction workers “kidnapped” Dr. Durant, etal;,in 1869 and held them until back pay was paid..The workers held all the trump cards because Dr. Durant’s train was taking the UPRR “dignitaries” to Promontory Summit to witness the “Golden Spike” ceremony.Strange how a little knowledge of local history materially improves the quality of a visitors visit to seemingly barren places. I have included a link to the travel guide shown in the image below. 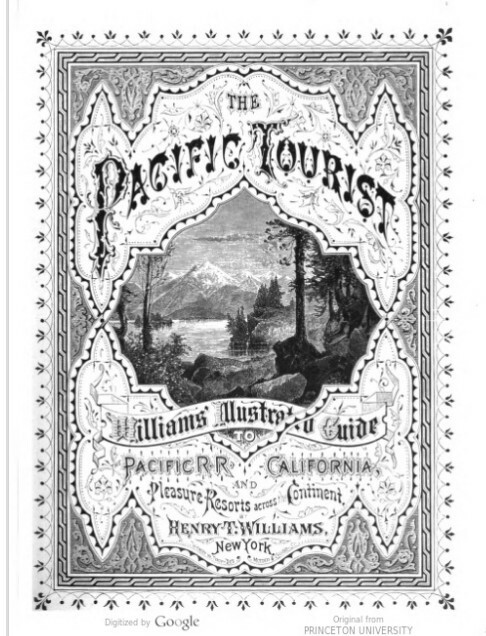 It tells the story of Piedmont and other places that lie along the first Pacific Railway. I must warn you that reading this type of book can become very addictive and will cause harm to other plans you may have.